On July 27, 2018, the Illinois office of FirstService Residential held its annual banquet and invited 60 of its top-tier vendors to participate in the event. The banquet drew approximately 100 property members and board members. All proceeds from the event benefited Lurie Children’s Hospital, which provides world-class care for children. Lurie Children’s hospital employs over 1,400 physicians representing 70 pediatrics specialties. 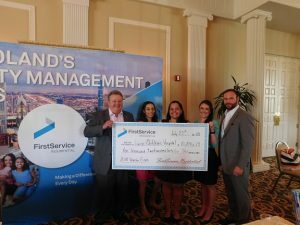 Pictured in the photo (from left to right): FirstService Residential associates Robert Meyer, Tycee Hightower, Jennifer Garza, Jennie Cimino (Lurie Children’s Hospital), and Asa Sherwood, president, FirstService Residential Illinois.